Photo credit to Grand Rapids Downtown Inc. The social and cultural significance of revitalizing the Grand River cannot be understated. The project literally restores the City’s namesake and with it the icon of the community’s natural heritage. The project will transform the river channel from a divider of east and west into a central gathering place for the community to recreate, contemplate, and reconnect around this shared, iconic place. Through our partnership with the City of Grand Rapids and our participation in the River for All project, there will also be tremendous opportunities to enhance shoreline recreation activities such as spectating, bird watching, hiking, and simply enjoying the natural sights and sounds of the rapids. A River for All is a project of the City of Grand Rapids that includes the design of 6 opportunity sites along the Grand River and the creation of design guidelines. The design guidelines apply to the entire 7.5 mile river trail that will someday flank both sides of the Grand River from Riverside Park to the north and Millennium Park to the south. Businesses and activities along the Grand River have the advantage as having the River as a front yard. The rushing water and natural habitat makes for a spectacular background. Take for example Movies on Monroe, an event hosted by DGRI. 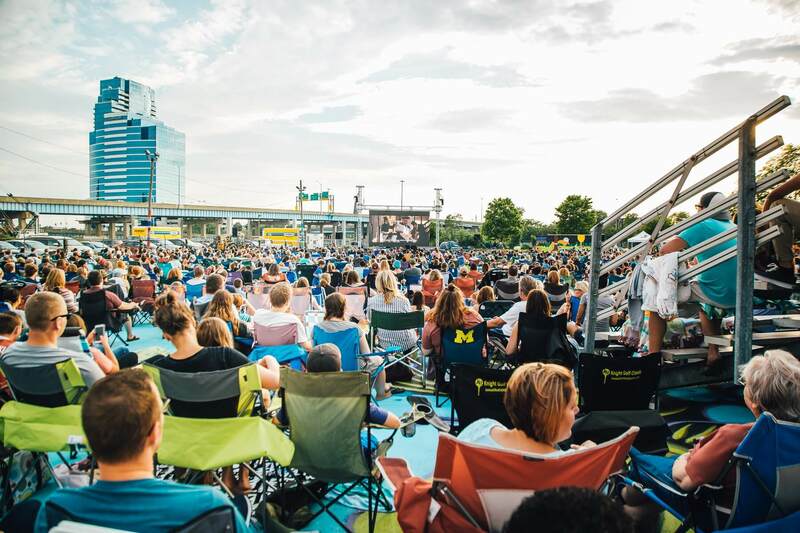 The public event, held on the banks of the Grand River, draws thousands of visitors to the North side of Monroe to screen movies and participate in fun activities. In 2017, Outdoor Magazine sited the River Revitalization project as the primary reason Grand Rapids was named “Best River Town.” The project has also been labeled “GR’s Game Changer” by CSL International for being a unique visitor industry asset. This designation is just one example of the impact the project will have on the region’s attractiveness when completed.